Nominate an ‘unsung hero’ for a Ride in a vintage p-51 mustang! 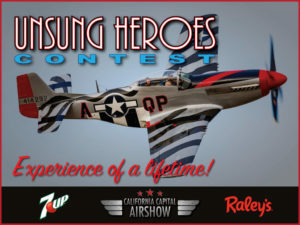 7UP and Raley’s have partnered with the California Capital Airshow to offer a unique opportunity for an ‘Unsung Hero’ from the Sacramento region to ride in a vintage P-51 Mustang. The ‘Unsung Hero’ program is designed to highlight someone from our area who has given of themselves to better our community. Unsung Heroes might include an average citizen who saved a life; a renowned teacher; a community humanitarian; a local firefighter, paramedic, police officer, a retired military member or someone who mentors children or volunteers as a coach or tutor in a youth program. People ineligible for the program include but are not limited to, active-duty military members, elected and appointed officials, unit honorary commanders, newscasters, reporters, board of directors or other individuals who have the ability to garner publicity in their own right.